Mo made the buying experience very easy for my mother and I. He was professional and courteous and took the time to explain the vehicles option we purchased to my mother . Overall very good experience. Awesome and reasonably priced. Thanks for being so friendly. Cyndi always takes excellent care of me. Not only is she friendly, but she make sure that I get the repairs I need without trying to talk me into anything I do not need. People say that taking your car to a dealership for repairs is a rip off. I have never found that to be the case thanks to Cyndi. For entrance to Service Department, turn South on Sandtree Dr. from Northlake Blvd. Second entrance on the left. At Schumacher Volkswagen of North Palm Beach, we understand that our success comes from our customers. Whether you’re shopping our lot for quality Volkswagen cars for sale in North Palm Beach or dropping your vehicle off for repairs, you’re a part of the Schumacher family, and you can expect to be treated that way. Looking for your next new Volkswagen? With diverse options like the Volkswagen Atlas, the Volkswagen Tiguan, and the Volkswagen Passat, we have a car or SUV for every kind of driver. More interested in finding a quality pre-owned vehicle? You can count on the dependability of our lineup of used cars for sale in North Palm Beach. Before you decide on your next VW, make sure to check out our list of current used car specials and lease deals to help you save. We work to take the stress out of auto financing with a quick and simple lease or loan process. We’re also your one-stop Volkswagen service center, offering quality OEM parts, VW service coupons, and a team of highly-trained technicians. 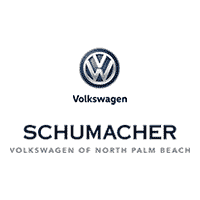 Visit our North Palm Beach, Florida, dealership and become a part of the Schumacher family. We’re proud to serve customers from Lake Park, Jupiter, and beyond. Contact us at (844) 783-3509 if you have any questions.